The Baylor Institute for Immunology Research (BIIR) is among the leading translational immunology research centers in the world. The team at BIIR is committed to advancing the most innovative and effective immunotherapy available against diseases, including cancer. One of the team’s discoveries has included a promising therapeutic vaccine for metastatic melanoma. According to the American Cancer Society (ACS), melanoma accounts for about 4% of skin cancer cases, but it causes about 79% of skin cancer deaths. The number of new cases of melanoma in the United States is on the rise, and over 8,600 people died of this disease in 2009. BIIR has developed a patient-specific cancer vaccine for late-stage metastatic melanoma patients. Researchers isolate human dendritic cells, unique to the patient, and then load them to specific antigens. Re-injected into the patient, these newly engineered cells activate the immune system against cancerous cells. The treatment, unlike chemotherapy or radiation therapy, has no major side effects. To support their research, BIIR constructed a large-scale vaccine manufacturing facility for Phase II/III clinical trials. And more recently, the Institute built a BioSafety Level 3 enhanced (BSL-3E) laboratory. 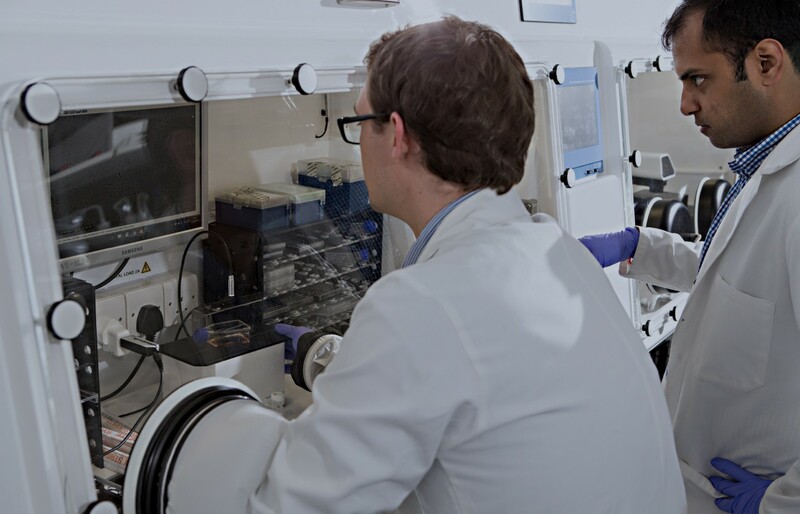 These state-of-the-art facilities enable the manufacture, controlled freezing and storage of patient-specific vaccines and research of highly pathogenic organisms. When it was time to expand and upgrade the laboratories, BIIR turned Baker for expertise surrounding the lab design and consultation on what equipment would best suit BIIR’s applications. The vaccine facility was ultimately constructed for compliance with the FDA's current Good Manufacturing Practices. Manufacturing this particular cancer vaccine is labor intensive and requires hours of concentrated work in biological safety cabinets. When it came to choosing individual biological safety cabinets, two dominant criteria positioned Baker as the best source: performance and reliability. As a result, 45 out of the 56 biological safety cabinets installed in the BIIR facility were Baker SterilGARD Class II Type A2 cabinets. For the safety of the patient, the work environment must be absolutely free from contamination. This is even more vital because the vaccine, which consists of human cells, is injected into the patient as a perenteral product. Baker cabinets are designed and manufactured to operate wthin a performance envelope that guarantees the widest margin of safety and product protection under demanding laboratory conditions. This safety margin completely ensures the integrity of the vaccine and gives the researchers peace of mind that the Baker cabinets are providing the highest degree of product and personnel safety. Melanoma is the deadliest form of skin cancer and, unfortunately, when is has become metastatic, it progresses extremely quickly. Rapid turnaround of vaccine is crucial, and reliability in a safety cabinet is consequentially paramount. With lives in the balance, BIIR researchers cannot be delayed by equipment “downtime,” malfunctions, or lapses in technological support. Baker biological safety cabinets are handcrafted to the strictest standards in the industry; their durability and dependability are unmatched. Additionally, each unit at BIIR is backed by a team of experts at Baker who are on call should any technical issues emerge. Over one hundred patients have participated in the research, and for some, the work and research at BIIR has been truly lifesaving. A number of patients who have received these experimental vaccines have gone years with progression. The successes and discoveries with dendritic cells have even allowed BIIR researchers to begin applying their immunotherapy research across new areas of disease studies, including HIV, pancreatic cancer and prostate cancer.